the holiday season always involves a lot of eating, doesn’t it? 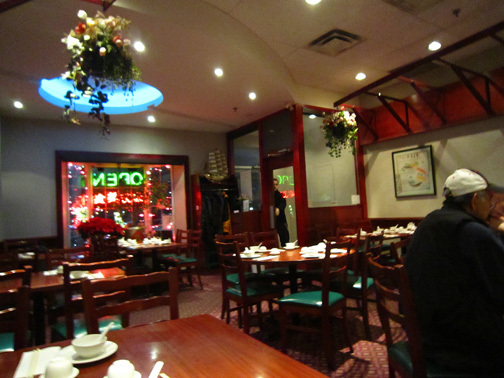 i thought this would be a relevant time to share my recent experiences at two Chinese restaurants in the GTA that offer peking duck (also called beijing style roast duck). first off, in case you are wondering, my Christmas meal still includes turkey, however peking duck is an any time of year tradition :) secondly, while i have eaten peking duck in Beijing, this was several years ago, well before i developed an appreciation for what qualities make for a good one. i had no clue that the bbq roast ducks hanging in the windows of chinese bbq takeout places weren’t really just one and the same. i’m not sure that a lot of people do know the difference, having read comments about how many restaurants pass off bbq roast duck as peking duck. what’s the difference? the coles notes version: peking duck involves more preparation steps prior to roasting, including separating the skin from the meat so the skin can really crisp up, and different flavouring ingredients are used. there are countless places you can go for peking duck in the GTA, so why am i writing about these particular two? most food aficionados would say these are the most authentically prepared and pretty much that makes them the best in the city.